The Hause Eastern Tour for 2018 took them through Michigan and New York, by way of Ohio and Pennsylvania. Atticus got to meet quite a few relatives, and quite a few ancestors. Wenk family reunion, 2018. 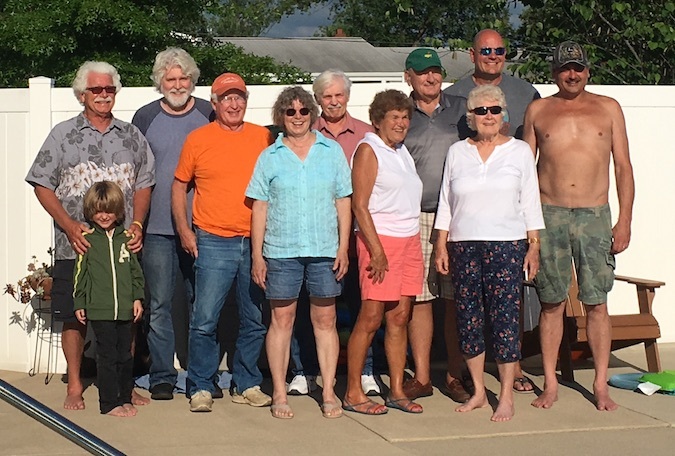 Front row: Atticus Hause, Jean Wenk Winans, Irene Wenk Poley, Martha Wenk-Hause; Back row: Charles Wenk, Jeff Hause, Don Wenk, Paul Wenk, Jim Poley, Terry Poley, Tony Poley. 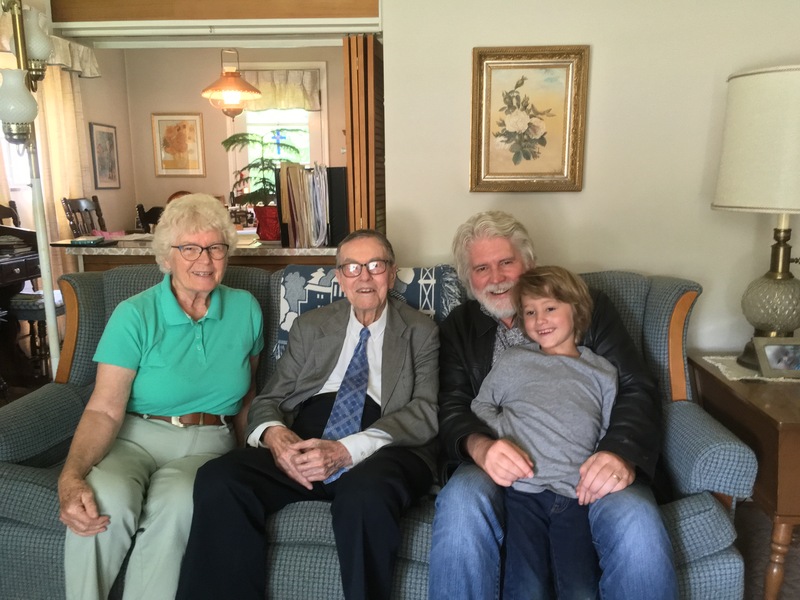 Martha Wenk-Hause, Jerry Hause, Jeff Hause and Atticus Hause at Jerry's home in Detroit during June of 2018. The waterfalls of Western New York: at Ithaca Falls, at Robert H. Treman State Park, Taughannock Falls State Park, and Montour Falls, Schuyler, NY. Atticus at the Old Dutch Church in Sleepy Hollow; Zion Lutheran Church near Chelsea, MI, and the Church of Lucy, in Jamestown, NY. 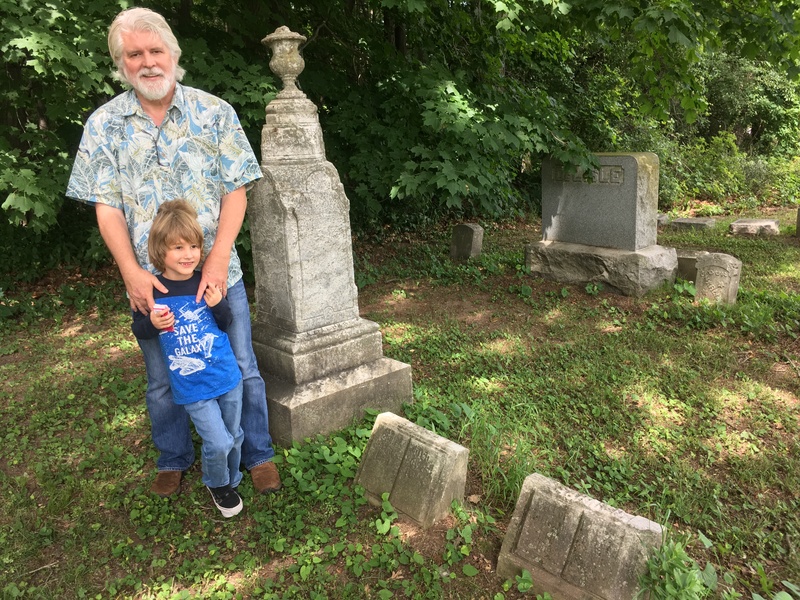 10-Generation photos of Atticus Lee Hause with William Hause, on 16 Jun 2018, just over 200 years after William's death, on Hause Hill on the border of Dundee and Tyrone, NY. When Atticus prepared to visit Sleepy Hollow, he watched an episode of "Man vs. Food" that took place in the area and became OBSESSED. Man LOST in this episode, and Atticus was determined to make things right again. In these photos, Atticus samples the food of Sleepy Hollow "Man vs. Food" episode at the Dobbs Dawg House² and J.P. Doyle's³. ³J.P. 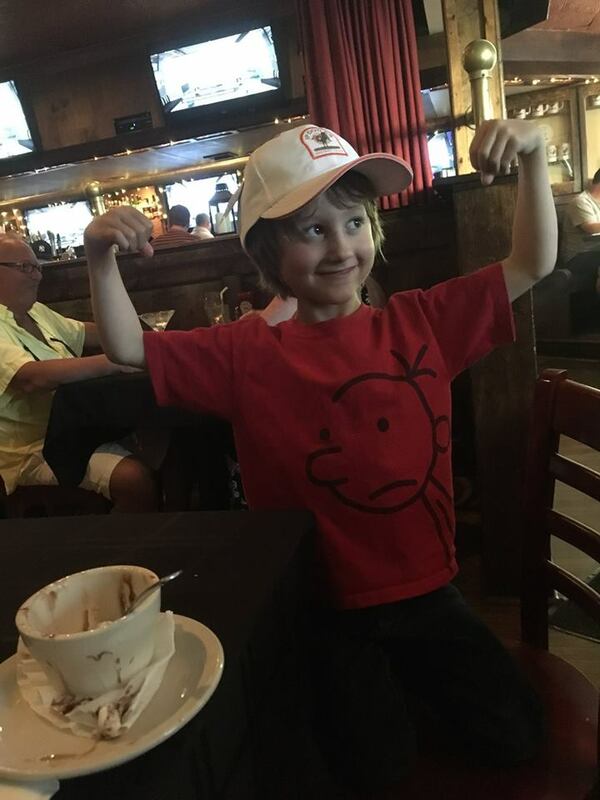 Doyle's Restaurant and Public House, 48 Beekman Ave, Sleepy Hollow, NY 10591; (914) 631-3015. 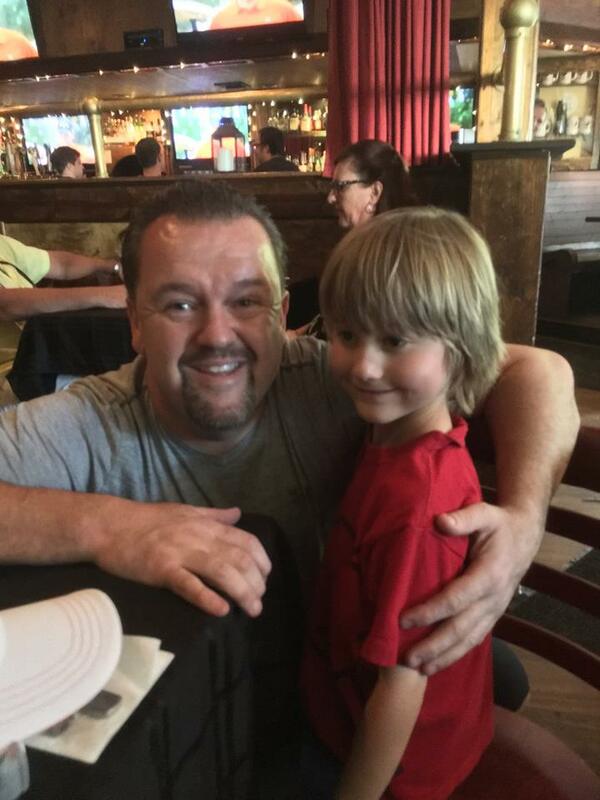 Atticus poses with Nicholas Bell, who appeared on "Man vs. Food." Atty was completely star-struckhad a bigger reaction than when he met Boba Fett at Disneyland. (Of course Boba Fett didn't give Atticus a quarter-pond of bacon on a cheeseburger to eat, so he was at a severe disadvantage.) Atticus's target was the Headless Horseman: A 10 oz. burger topped with bacon, cheddar cheese, tomato, onion, pickles, lettuce and homemade chili... Atticus had it minus the cheddar cheese, tomato, onion, pickles, lettuce and homemade chili... but he NAILED IT. Ate it with a side of fries. 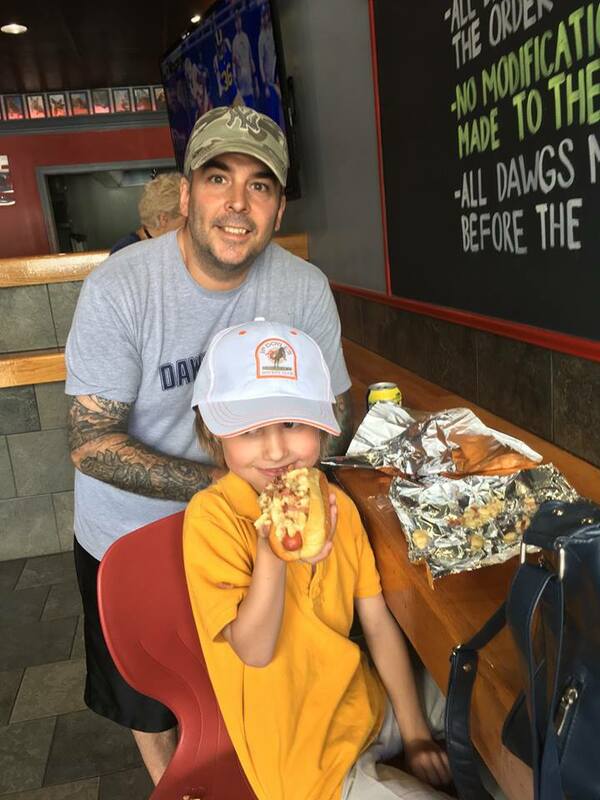 His method: from the top-down, starting with the bun, then bacon, then burger... then give dad the last bites and say, "DON'T TELL ANYBODY!!!"